You are here: Home / Natural Fine Planetary Talismans / Quicksilver Mercury Energies with a Brazilian Emerald ring in 22K Gold! Quicksilver Mercury Energies with a Brazilian Emerald ring in 22K Gold! Comments It is a pity that we were not able to catch the true beauty of these Brazilian Emeralds in our online inventory. However, each of these come out so beautifully once set. 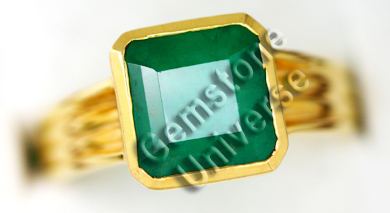 This Brazilian emerald lot is a rare lot and will give the best results for Lord Mercury. Don’t let them go.